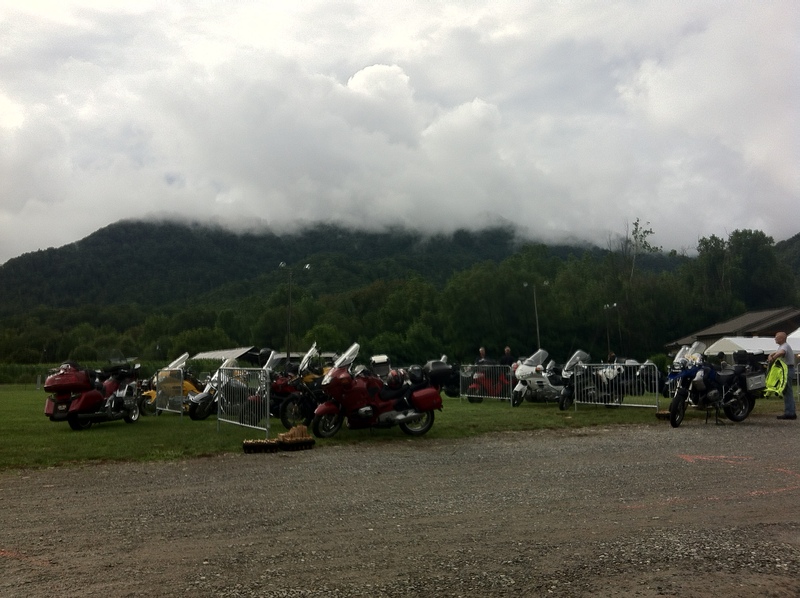 RoadRUNNER Motorcycle Touring and Travel magazine are holding their annual touring “weekend” in Snowshoe, WV this year. The event will take place from July 17- July 20. This will be my third year attending the weekend and it’s become and event I look forward to every year. If you’d like to attend a more intimate rally (~300-500 riders) full of riders with a focus on touring, making friends and riding great roads this is the rally for you. To get more information about the rally go to the RoadRUNNER website page about the touring weekend. I’ll be there again, I hope to see you there too. If you are coming let me know so we can meet up. Smoke Chasing Grand Tour 2013 (SCGT13) is proud to be a sanctioned AMA National Grand Tour and a featured Team Strange Airheads™ GT once again. Smoke Chasing is a self-paced BBQ/”Smoke” nationwide Grand Tour that combines your love of motorcycling and great food. This GT can be completed in any state or states at the discretion of the rider and the GT concept is simple. 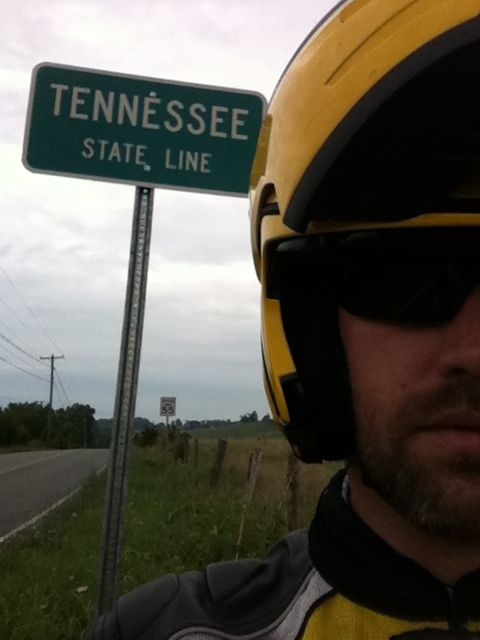 A rider simply documents 20 or more visits to BBQ and Smoke restaurants, streets and cities taking photos featuring their motorcycle cycle, GT Flag and signs. SCGT13 is a perfect complement to your day trips, weekend rides, team rides, club rider events, and can easily be part of your long distance adventures and rallies. SCGT13 is open to all makes and models of motorcycle and all types of riders. Registration opens on February 15th and riders can register through June 30th. The GT runs from March 1st to November 30th 2013. Your $27 entry fee includes a “rally flag” to document your ride. All finishers will receive a certificate and a chance to win prizes. Visit www.smokechasing.com for more information. Tuesday July 10th I set my Navigon GPS app to the Scenic Roads setting and left the office at noon headed for Maggie Valley, NC. My destination was the RoadRUNNER Touring Weekend for 4 days (weekend?) of riding and fun. The RoadRUNNER Touring weekend was to be my first motorcycle rally. I was anxious and a little worried about what I would find there. I chose this rally because I anticipated it would be attended by riders who shared my love of touring, motorcycles, and riding. I was hoping to find a congregation of like minded people. These hopes where based solely on the content of the magazine. It’s a testament to RoadRUNNER Magazine that I was not disappointed, even with the wet weather. As I motored along the 500+ miles to the rally I began thinking about when I left home to go to college. My car all packed up, I headed across the country to a place where I would know no one and wasn’t sure what to expect. I’ve been on overnight and week long motorcycle trips before, but always with a group of riders I knew. This was my first solo adventure. Like my trip to college that double punch of excitement and anxiety you get when the roller coaster is just cresting the top of the hill was with me the whole ride. In this case however that could just have been the mountain roads I choose to ride. My GPS found roads that kept me off the highway but still moving at a good clip. Passing through small towns and hugging river valleys I arrived in Wyethville, VA around 5:00 pm and booked myself into a hotel for the night. So far I’d avoided the rain but looking at the weather for the next few days I suspected I would be getting soggy. 80% chance of showers all day and continuing through Saturday. My only solace was that temperatures would be in the high 70’s to low 80’s. “Well, at least it’s not hot” would become a mantra for several of us at the rally for the next damp four days. Wednesday dawned dark and cloudy as expected. I slid into my gear and one piece Revit! rain suit prepared for a wet 200+ miles to Maggie Valley. Almost immediately the rain started in and kept up off and on for the rest of day. Even with the wet it was a memorable ride. The GPS picked a route that was a preview of the guided tours setup by the RoadRUNNER staff for Friday and Saturday. 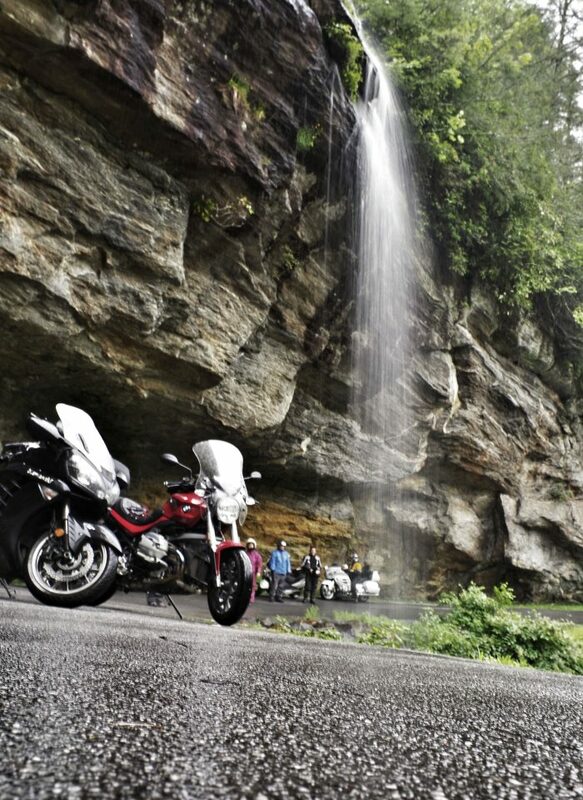 Having ridden to the Smokey Mountains a few times now I think you have to look pretty hard to find bad motorcycling roads, even when they’re wet. The following days at the rally where spent in a cycle of ride, eat, repeat. We centrally gathered under the “circus” tent for any and all events. This provided for plenty of opportunities to meet fellow riders and magazine staff members. Whether we were preparing for a ride, eating dinner, listening to seminars or just hanging out there were always friendly people to talk to and good stories to be heard. A few times the laughing and story telling lasted well into the night accompanied by live bluegrass and rock and roll. Friday saw my first group ride leave under cloudy skies and rain. I joined up with a leisure touring group lead by John Flores (contributor and blogger for RoadRUNNER Magazine). One look at my 10,000 kW Hi-Viz rain suite and John declared, “I’ll be able to see you in another state” and designated me his sweeper for the ride. The pace was a little slow at first. Once I settled in, however, the slower speed allowed me to enjoy the beautiful scenery of the Smokey Mountains as we looped along twisty tree covered back roads. At Lunch I was fortunate to be able to have a conversation with John and pick his brain about the magazine, writing, blogging and photography (one of his passions). It was very informative. John is terrifically nice guy and so easy to talk to that it was a real treat. After lunch the skies cleared up and we were able to appreciate the roads and the ride with out distraction. Saturday I switched to a sport touring group lead by Florian Neuhauser. Once we were all sorted out into the right place in the group we flew through the first mostly sunny day of riding all week. I’m actually glad that I was able ride with the leisure group the day before and enjoy the scenery. Most of what I saw on this sporty ride was the yellow divider line and the taillight of the bike in front of me. Florian set a pretty spirited pace. It was nice to be able to let the connie stretch her legs a bit. I found myself at Florian’s table at lunch and, like the day before with John, had the opportunity for some Q and A about writing and riding for the magazine. Saturday evening we were lavished with a meal of steak, potatoes, salad and drinks. Dinner was to commemorate the late Christian Neuhauser, who’s family started RoadRUNNER Magazine in 2001 just 2 years after moving to the US from Austria. Christian passed away in 2004 but he and his “family’s undaunted enthusiasm for motorcycle touring” live on through their commitment to riding and the magazine they started together. As the evening wore on goodbyes where said, email addresses exchanged, and promises to “See you next year” where made. I have a feeling that many of those promises will be kept.